- Pools from 20,000 up to 130,000 litres. - High quality pools where quiet operation is a must. - Pools where high efficiency is required. The Onga SilentFlo is an ultra-quiet, high-efficiency, self-priming, medium head pump in 3/4 through to 2hp with an extra large, integral hair and lint strainer. SilentFlo is precision moulded with Pentair's innovative thermopastic composite resin that is not only tough and highly corrosion resistant but is design to dampen the noise created by the pump giving ultra-quiet operation. Silentflo features a high quality mechanical seal, stainless steel shaft and fasteners which will ensure that this pump will give top performance and reliability for years to come. 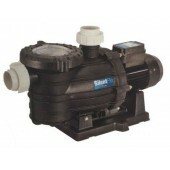 Not sure which Silentflo Pool Pump is right for your set-up? contact us. We're happy to help!